I wanted to wear a funky outfit today, something I would never wear to work. I knew I wanted to wear one of my fedoras too. 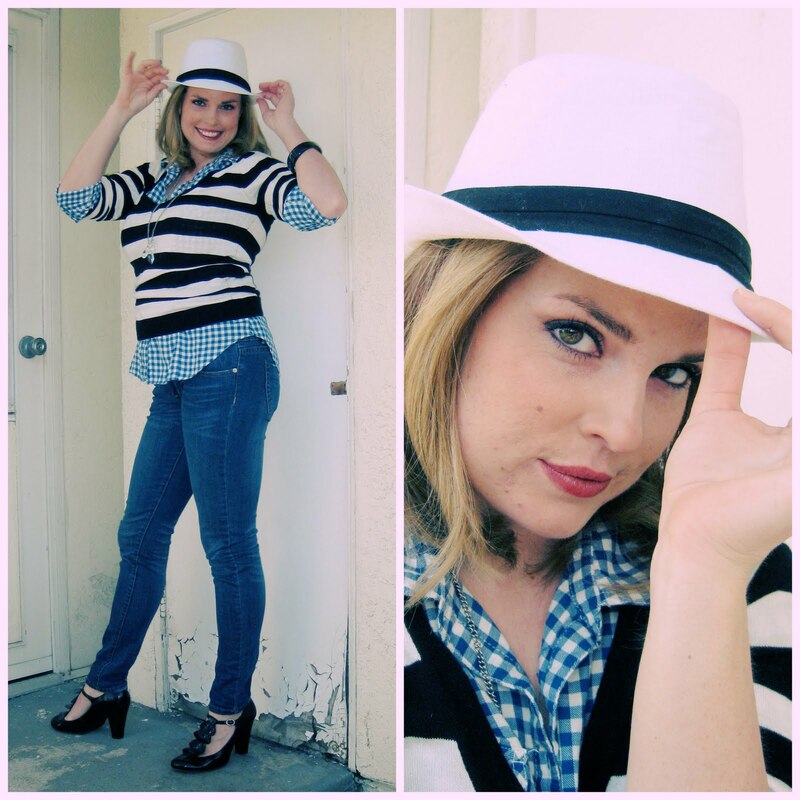 My sister, over at Be Sassy Classy, suggested we both wear fedoras with a funky outfit we normally wouldn't wear and call today Funky Fedora Day. Turns out I really like my outfit. Never-ever would I have put a gingham shirt with a stripped sweater together before, but somehow it works. Who knew? This might be a look I will wear more often. I love when people successfully combine patterns like that, adorable! Love love love this combo!!! 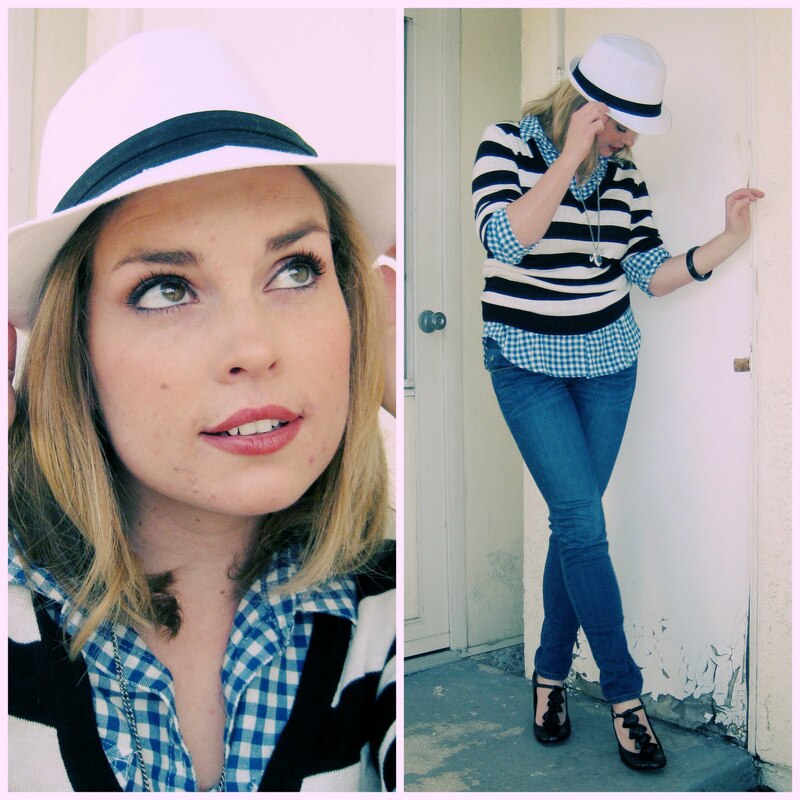 And now I want a fedora and can't shop...perhaps I'll bend the rules and have boyfriend buy me one! super cute shoes! and awesome pattern mixing :) great job!!! Love the fedora too, I'm a sucker for hats. Loving the stripes and checkers together. And my new thing is fedoras too! I love how you created a day for it. Way to step outside of the box. It feels a little exciting to wear something that might make you feel a little uncomfortable, but the pay off is great! Love this outfit. so cute and fun! you are adorable! I love everything about this. I mean LOVE! the shoes the plaid & stripes, perfect. I'm impressed with the hat too, I love it. Although I need a plaid shirt, I am so inspired to try this! You look gorgeous!